Much of America’s desert southwest is defined by one river: the Colorado. Born of snow pack high in the Rocky Mountains, the Colorado River surges its way south and west into the state of Utah, its rock-shaping power among the defining characteristics of spectacular Canyonlands National Park. The river is mostly undammed above Cataract Canyon; thus, varying water levels at different times of the year provide a whitewater experience for everyone. Seasons experiencing average and/or above average snow packs will likely see highwater in May and June. During high-water season, experienced whitewater enthusiasts delight in the huge waves and the famous “Big Drops,” which at times can make even the Grand Canyon’s Lava and Crystal Rapids seem tame. Outside of high-water, it is a great family-friendly run, with less intimidating rapids suitable for most ages and levels of experience. We meet at 6:00 PM in the breakfast room at the Gonzo Inn for a pre-trip meeting. This is an opportunity to meet your fellow travelers and ask any last-minute questions. Your trip leader will give you a thorough trip orientation and pass out your waterproof river bags so you can pack your belongings that evening. We’ll get going first thing in the morning, taking a short drive to our Colorado River put-in at Potash. Upon arrival at the boat ramp, our guides will present a brief safety talk and orientation to our boats and gear. We’ll cover some miles on the first day, likely stopping for a short hike to see some 250-million-year-old petrified wood. We’ll make camp on a big sandy beach, watching afternoon turn to evening as your guides prepare dinner and the sun sets behind towering canyon walls. Morning begins with a coffee call from the kitchen. Grab a hot drink and watch the sunrise play out on the cliffs above you. Get a head start on packing up your dry bags, and then enjoy a hearty breakfast and some time to relax as we get our gear back on the boats. The river meanders peacefully, each new bend revealing stunning views of eroded canyon country. Hiking opportunities may come at the Lathrop archaeological site or Indian Creek Canyon, where Ancestral Puebloan ruins and a stunning seasonal waterfall await. As we head downriver, the Colorado winds through the Loop—an exceptional example of the river’s convoluted twists and turns and a venue for another great hike—before we reach the confluence with the Green River. Here, the current picks up, signaling the beginning of Cataract Canyon. We’ll try for one of the great campsites in the upper reaches of Cataract Canyon. We won’t let the mesmerizing spectacle of a billion bright stars keep us awake too late, wishing to be well-rested for the days to come. Our day begins with a relaxing breakfast and then we’ll be off into the roiling depths of Cataract Canyon to challenge the Big Drops and the big wave thrills of the mighty Colorado. After a day of drenching whitewater excitement, we’ll make camp and toast to the thrills and spills with new friends. Revel in a final night at the river’s edge as your guides prepare a farewell feast. After a delicious breakfast, we’ll be back on the boats winding through the final dramatic miles of Cataract Canyon, where lofty cliffs rise 2000 feet above us. Soon, we’ll reach the impounded waters of Lake Powell, held back by Glen Canyon Dam 180 miles or so downstream. After a final lunch on the river, we’ll come to our take-out at Hite Crossing where we’ll say goodbye to our guides and take a five-minute van shuttle to the airstrip. The scenic flight to Moab grants a bit of time to reflect, as we trace our path backwards through Cataract Canyon from high above, looking down on the beautiful landscape from a bird’s-eye perspective. 2 waterproof bags to hold your gear for the trip (approximate sealed size: 13” diameter x 25” tall, not to exceed 25 lbs. packed). Your sleeping bag and pad must fit into one bag and your remaining gear will fit into the other bag. Please note: If you rent our gear it will come already packed in one of the two waterproof bags issued to each passenger. Your remaining gear, therefore, must fit in one bag. Sleep Kit: Can be rented for $40 per person. Sleep kits consist of a sleeping bag, deluxe 3-inch thick foam and air-filled sleeping pad, ground tarp, sheet, pillow and pillowcase. Single Tent: We provide 2 person tents. It is assumed you will share this tent with another person. You can (if you prefer) have a tent to yourself for an additional charge of $30 per tent. If you enrolled in a Trip Mate policy through OARS on or before December 9, 2018, the policy is still in place and will be administered by Trip Mate through the end date of your scheduled travel with OARS. All information provided in regards to the Trip Mate policy remains relevant. For a complete description of your Trip Mate policy, go online to: http://www.tripmate.com/wpF431Z or call Trip Mate at 800-888-7292 (reference Plan # F431Z). ☐ Trip Forms (online): Each participant is required to complete the required trip forms within two weeks of making a booking. Refer to your confirmation e-mail for the link to the online forms. If you prefer to fill out paper forms, please let us know right away. If you are reserving within 60 days of departure, your forms must be completed immediately to ensure we can properly plan for your trip. The day before your trip we will meet at 6:00 PM in the lobby of Gonzo Inn for a pre-trip meeting. Your trip leader will provide a thorough trip orientation and pass out your waterproof bags so you can pack your belongings that evening. The trip leader will also confirm the meeting time for the following morning and give you an opportunity to ask any last-minute questions. Keep in mind that the state-run liquor store closes at 7:00 PM. 3.2% beer can still be purchased at gas stations and the grocery store and full-strength beer in cans can be purchased at the Moab Brewery. From Grand Junction, Colorado take I-70 West to US 191 or take scenic route 128, which follows the Colorado River and offers spectacular views. From Salt Lake City, Utah take I-15 south to the Price/US 6 exit. Then take US 6 to I-70 East, to US 191 South. If you’re arriving by car, parking is available at the OARS Warehouse. 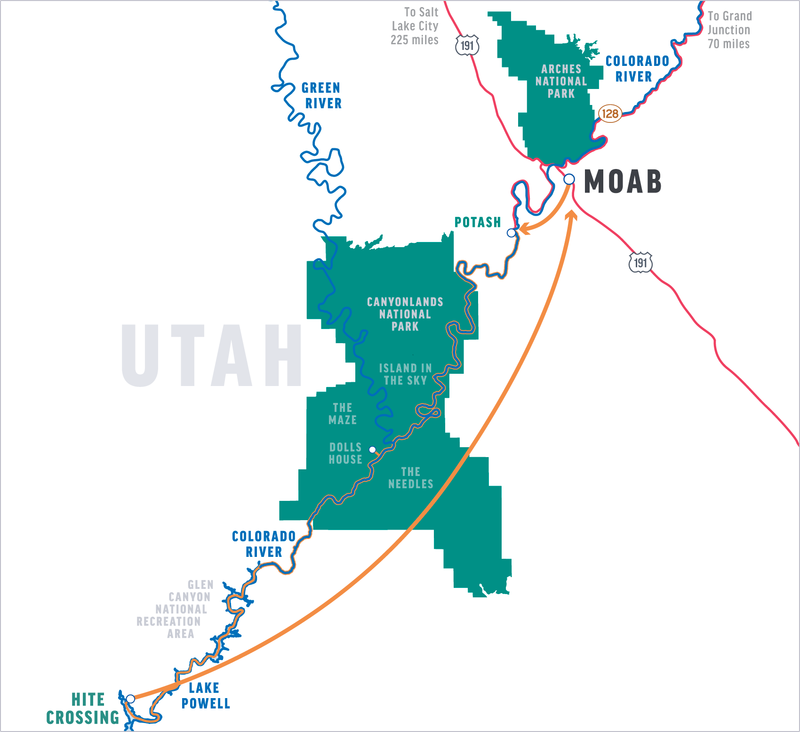 Commercial flights are available into Salt Lake City and Moab, Utah, or Grand Junction, Colorado. Moab Express – Offers point to point shuttle services from Canyonlands Field (CNY) to commercial and private properties within the Moab area. Reservations can be made on their website. Canyonlands Shuttle – Shuttles from Moab to anywhere within a 500 mile radius. Call (435)210-4757 or visit their website to make a reservation. Unless you have a large group, a rental car from Salt Lake City is usually the best option; even if it sits for a week while you are on the river. This allows you the flexibility to visit surrounding areas and sometimes is more economical than renting a vehicle one way or chartering a shuttle service. There are two Enterprise Rent-A-Car locations in Moab. Please contact them directly for pricing and location hours as they are subject to change. Both can be reached at (435) 259-8505. Your return time to Moab will be between 4:00 and 6:00 PM. Please be advised, however, that it may be necessary for your belongings to be transported in the shuttle truck, which will arrive in Moab several hours after you do. (The plane’s luggage allowances vary depending on the number and weight of passengers on each flight.) Because of the possibility for delays and late arriving luggage, we strongly suggest overnighting in Moab after your trip. *Please mention you are an OARS guest when making your reservation as some hotels offer our guests a special discounted rate. You might be coming to Moab, Utah for the rafting, but once you get to this cool little adventure mecca in the heart of canyon country, you’ll realize the adrenaline-pumping activities are endless. Always wanted to try your hand at canyoneering? Slip into the lost world of a slot canyon on a guided tour of Fiery Furnace or one of the many other rocky labyrinths in the area. Prefer exploring on wheels? Rent a mountain bike and challenge Moab’s famous 10.6-mile Slickrock Trail. Or, if you’re not afraid of heights, opt to see Moab’s spectacular red rock country from the air on a hot air balloon ride or zip line adventure in the “backyard” of Arches National Park. Visit www.discovermoab.com for more information. The Colorado River can exhibit extreme variations in water levels at different times of year, providing a whitewater experience for everyone. In the high-water season of May and June, experienced whitewater enthusiasts delight in the huge waves and the famous “Big Drops,” which at times can make even the Grand Canyon’s Lava and Crystal Rapids seem tame. This is some of the biggest navigable whitewater in the U.S. at peak flows. Later in the season, from July through October, as the water levels drop, this becomes a more moderate run with less intimidating rapids, suitable for most ages and levels of experience. The dammed waters of Glen Canyon back up into the lower stretches of Cataract Canyon, with some 20-plus rapids still buried under water or sediment. With the wildly varying reservoir levels and changes in seasonal river flow, this stretch of the river is always in flux. The sheer depths within the Cedar Mesa & Honaker Trail formations are breathtaking, but camps become limited and are often on the sediment beds that used to be the bottom of Lake Powell when it was at full-pool. Reservoir levels and river flow will dictate how much time motorized assistance will be needed to navigate this last section of the trip. Astronomy (Stars with Lars): With access to clear, dark skies undiminished by urban light pollution, you’ll witness a star display as you’ve never seen before. OARS astronomy trips are scheduled around the new moon to allow for optimal stargazing opportunities. Our resident astronomy expert, Lars Haarr, puts his laser pointer to good use and provides informal educational discussions each evening on such topics as the history of constellations and Native American interpretations of star movements and groupings. Adult-only Departures: Don’t feel guilty if you’re in need of a kid-free vacation. Everybody deserves a break from the daily grind, and sometimes that means leaving the kids at home (or not traveling with other people’s kids). Whether you’re vacationing with your significant other, friends, colleagues or flying solo, OARS kid-free departures offer all the fun and adventure that our normal itineraries offer, minus the kiddos. After each active day on the river, we pull ashore to camp for the night. Upon arrival, our first task is to unload the boats using a bag line of crew and passengers to expedite the process. Individuals then collect their waterproof bags and locate an area on the beach to camp for the night. On the first night in camp, a crew member will give a demonstration on setting up a tent, which you’ll see is quick and easy. The guides will set up the kitchen and central dining/seating area with camp chairs. They will also locate a secluded area away from camp to set up the portable toilet, where privacy is assured. We need to know as soon as possible about any dietary restrictions we should consider in planning your trip. If you have food allergies or restrictions, we will do our best to accommodate your needs. However, there may be a supplemental menu fee, ranging from $5-$25 per person per day, to cover any increase in our increased costs. We cannot guarantee that cross-contamination from allergens will not occur during meal prep, and reserve the right to refuse service to anyone as it relates to safety, including the potential for a medical emergency caused by a severe food allergy. We recommend that anyone who has had an allergic reaction, be it mild or severe, secures an Epi Pen (or equivalent) for the trip. Also, due to the constraints of cooking for a large group in a wilderness setting, availability of ingredients or specialty items in remote locations, and limited packing space, we are unable to cater to dietary preferences (likes or dislikes). We provide fresh water and an assortment of soft drinks, including sodas, sparkling water, fruit juices and lemonade. Utah’s commercial outfitters may not provide any type of alcohol for their guests. You may bring your own supply of beer, wine or liquor in non-glass containers. If you choose to bring your own drinks (other than what we provide) or alcoholic beverages, please let us know in advance, ideally at the pre-trip meeting. For your safety and the safety of others, alcoholic beverages are limited to camp. Some beers (3.2% alcohol by weight) are available in grocery stores. For other beer, wine and liquor you will need to go to the Utah State Liquor Store. The hours are 11:00 AM to 7:00 PM year-round. They are closed on Sundays and holidays, including Pioneer Day (June 24). You may check their website for further information and to see what beverages are available: abc.utah.gov/stores/. Each day varies, but on an average you’ll spend 4-6 hours a day on the boats. The rest of the time will be spent hiking and exploring, eating, or just relaxing in camp. While we generally plan at least three guided hikes on each trip, there is ample opportunity for the curious to explore the area at length. Please let your trip leader know if you are an avid hiker and remember to bring extra water bottles and good shoes. Remember, however, that all hikes are optional and you can choose to lie on the beach and take in a few tanning rays or read a book instead. Lastly, the Trip Leader must consider to overall ability of the group when deciding what hikes to offer. While the idea of a river trip is appealing to most people, many are inhibited or reluctant because of modesty or uncertainty. To minimize our impact, we carry out all solid human waste and use a portable toilet system that is set up each day at camp in a secluded location a discrete distance from tent sites. It is essentially a toilet without plumbing and is available from the time you pull into camp each afternoon until you leave camp the next day. Toilet paper and a convenient hand-washing station are provided. We also carry a small container called the “day tripper” that can be easily accessed during the day should the need arise. It is a personal disposable toilet, which includes an odor-proof transport bag, chemical solidifier and odor eliminator, toilet paper and an oversized hand wipe. On popular stretches of wilderness rivers, the common refrain is “dilution is the solution to pollution.” We practice this approach by urinating in the river during the day. For use in camp at night we provide pee buckets so that urination can occur in a secluded location and then be dumped into the current where it will be carried downstream. Please follow your guide’s direction in sanitizing the pee buckets. Bathing is allowed in the Colorado River, but must be done with biodegradable soap. It is not, however, allowed in any of the side streams that feed into the river. If you plan to bring soap, we recommend Campsuds or Dr. Bronner’s, which can be purchased in most stores that have a camping section. Disposable anti-bacterial towelettes (Coleman Swash Cloths, baby wipes, etc.) are good alternatives to submersion in the river and are especially convenient for spring and fall trips. Clothing can easily be washed out in the river with biodegradable soap. With the dry warm climate in Canyonlands, lightweight clothing generally dries out quickly. Please Note: The color of the river fluctuates from completely clear to very silty. Light colored clothing has the possibility of becoming permanently stained. Even if you aren’t anticipating your menstrual period, come prepared for it. You can use sandwich-sized Ziploc baggies during the day to store feminine products while you are on the river or hiking, and you can then discretely dispose of the baggies when you reach camp. When possible, we recommend o.b.® tampons, which are 1/3 the size of regular tampons, tuck discreetly into pockets and have less paper wrapping. If you use pads, be sure to bring extras. Many women suggest bringing a small supply of baby wipes. We provide some feminine products on most trips for emergencies and a trash conveniently located by the toilet-please don’t put the feminine products in the toilet itself. We provide a small waterproof bag (17” tall x 9” diameter—approximate sealed size) to hold your camera and other items you might need during the day. While these bags are designed to be waterproof, you may wish to place your camera in a zip-lock plastic bag or waterproof casing for additional protection. We also strongly recommend you take out a rider on your homeowner’s policy to cover your camera—especially if it’s fine equipment. Make sure to bring additional memory cards, batteries and any other extras you will need. Disposable waterproof and panorama cameras are also a fun option. The use of electronic devices, especially music players and flying drones, on your trip may represent an intrusion into the wilderness experience of your fellow guests. We ask that you be mindful of the impacts to others and respect the wilderness nature of the trip. Please bring headphones if you intend to listen to music during the trip and leave your drone at home*. *The use of drones is prohibited by the National Park Service in Cataract Canyon. Once you are on the river there is limited communication with the “outside world.” Cell phone service is not available. Our guides carry satellite phones which are strictly used to call out in case of an emergency situation on the river. They can call out, but we cannot call them. Periodically the trip leader will check in with our office. If you have someone that needs to contact you about an emergency at home, they should call our office (800-346-6277). If possible, we will relay the message to you. Keep in mind, however, it could be several days or longer before the message actually reaches you. For your family at home you should define for them what you consider an emergency and provide them with instructions to call our office in the event one occurs during your vacation. Fire activity frequently impacts the air quality on our trips, and occasionally wildfires may be present in the immediate vicinity of where we’re traveling. Smoke impacts are more likely in the latter-half of the summer season, so those with asthma or other respiratory conditions may wish to steer clear of this time frame. In general, we will not cancel a trip on account of smoky conditions, except in cases of clear danger to life or property. Necessary changes to logistics and/or destination may occur with very short notice as fire conditions are constantly changing. We will do our best to keep you apprised of excessively smoky conditions that can be foreseen for your upcoming trip, but we also encourage you to stay informed about local fire activity: https://inciweb.nwcg.gov/. Our guides do not carry firearms on our trips, and in most cases, are prohibited from doing so by the managing agency. As a matter of preference, we ask all our guests to kindly leave your own firearms at home or in your vehicle. You may want to check one week prior to your trip for an up-to-date weather forecast. We recommend the following website: www.wunderground.com for weather in Moab, UT. The flow of the Colorado River through Cataract Canyon is generally unregulated, meaning no single reservoir controls the water level. The river can reach flows considered extreme during spring runoff in years when the high country feeding the Colorado River watershed has received a plentiful snowpack. Peak run-off through Cataract Canyon usually occurs between mid-May and mid-June, but can vary widely from early May and into July. High water trips equate to a more intense whitewater experience and a high level of physical fitness is recommended. Water temperatures are coldest during the high water period and rain gear and warm synthetic clothing will be required. During the day—Start with a swimsuit and/or swim trunks and synthetic or merino wool shirt as a base layer. Additional layers for sun protection or insulation can be added and subtracted depending on the weather, temperature and how wet you’re getting in the rapids. In camp—When the weather is warm, lightweight cotton pants/skirt or shorts and shirt make great camp wear. Anytime the forecast calls for cool evenings and cold nights, a dry set of long underwear is the perfect base layer under long pants and a fleece sweater. During the day—The best choice is an amphibious shoe that drains water, protects your toes and won’t come off in swirling current. A retired pair of athletic shoes can work well, too. Sport sandals with a heel strap are a good option, especially on rivers with sandy beaches. Find professional-grade options made by Chaco® at www.chacos.com, the official footwear sponsor of OARS guides. In camp—We recommend wearing shoes in camp due to risk of kicking a rock buried in the sand or stepping on a sharp stick. The athletic shoes or light hikers you bring for hiking can double as your camp shoes. It’s nice to put on dry socks and shoes after a day on the water. Flip flops or slip-on sandals are OK for wearing in camp only. During the day—Wide-brimmed hats are a good choice for sun protection. Ball caps are also useful since they fit under helmets, which are required attire when paddling our whitewater rivers. In camp—When the weather is cool or cold, you’ll want a beanie-style hat to wear in camp. They are the perfect remedy for bed-head as you rise from your sleeping bag to secure your morning cup of coffee or tea, or for retaining warmth in the evening hours after the sun sets. A good way to keep cool is with a sarong or long-sleeved cotton shirts. Old collared dress shirts work well. They can be soaked in the water and worn in the raft or carried on a hike for later use. This method of evaporative cooling is very effective. Bandanas are another useful item that can be used in this manner. Camp-wear should be made of cotton and be loose-fitting. A combination of shorts/skirt and a lightweight top is ideal for staying cool on hot afternoons. Synthetic or merino wool long underwear is a must-have on any river trip. It can be worn under shorts, rain gear, T-shirts, etc., then stripped off when the chill of the morning has worn off. It keeps you warm even if it’s wet (which can happen easily), dries quickly, and it’s compact enough to be stuffed into your small waterproof bag or daypack after you take it off. It can be layered under your waterproof rain jacket and pants. In cooler weather a rain jacket and pants work better than a wetsuit, because the jacket and pants can be put on when it’s cold, or when you’re going through whitewater, then easily taken off when the sun comes out and it’s hot. Be aware that cotton items, once wet, do not insulate; only synthetic and wool materials will keep you warm during cool, wet weather. April, May, September and October Trips: These are surely some of the most beautiful months to be on the Colorado River, but they can also produce some surprisingly chilly times. During the fall, the sun is not far enough north in the sky for its warming rays to reach down into the river canyon for as many hours a day as it does in the summer. This means more shady areas, fewer sunny ones. Therefore, when you are splashed (drenched) going through the rapids and you’re in a shady area, you will get very cold unless you are prepared. Rain gear protects you from rain, wind and the splash of the rapids. It is one of the essential items that all passengers should have no matter what time of year you are traveling. Look for jacket and pants that are 100% waterproof, not just water resistant. A hooded jacket is recommended as well as good secure closures around your head, neck, wrists and ankles. Do not bring a rain poncho as it cannot be worn under your PFD. Mosquitoes can be bothersome at times in certain areas on the Colorado River, particularly after high water drops. Though this happens at different times every year, it typically begins in June and extends into July. It’s a good idea to come prepared with insect repellent. Long sleeved shirts and pants may be desirable at times. At the pre-trip meeting each person will be given two large waterproof bags (approximate sealed size: 13” diameter x 25” tall; 3318 cu in; 54.4 L). One bag will be for your clothing and personal items; the other bag will be for your sleeping gear (sleeping bag, sleeping pad, ground tarp, sheet and pillow). These two bags will be your “checked luggage” and will only be accessible in camp. Tents are stowed separately. Please note: if you rent our sleep kit, it will come already packed in one of the 2 waterproof bags issued to each passenger. We also provide a small waterproof bag for day use where you can keep items such as rain gear, camera, sunscreen, lip balm, etc. (approximate sealed size: 17” tall x 9” diameter; 1081 cu in; 17.7 L). The bags are cylindrical in shape and pack from the top. Please pack light, and keep in mind that river attire is casual: comfort, convenience and boat space take precedence over style. At the end of the trip, you will return to Moab with your waterproof bags, where you will be able to unpack your gear before your trip home. We recommend you take on the river only what’s absolutely necessary. Keeping gear to a minimum insures it will fit into the waterproof bags we supply and reduces unnecessary packing and unpacking in camp. If you do have extra luggage that you need to store, you may keep it locked in your car at our warehouse or you may be able to store it at the lodge you are staying at for an additional fee. We recommend that you leave your valuables at home. For personal items like wallets, purses and cell phones, we recommend putting them in a Ziploc bag at the bottom of your waterproof bag with your clothing. In reviewing your statement, you’ll note a $1/person/day donation to Utah Rivers Council a non-profit conservation organization dedicated to Utah’s rivers and clean water sources. One-hundred percent of these funds go directly to Utah’s rivers and your contribution is tax-deductible. This donation is voluntary and may be removed from your invoice if you choose not to participate. Please notify our office if you would prefer to delete the donation from your balance. Under most circumstances, if you are of an adventurous spirit and in reasonably good health, you should have no problem enjoying an OARS Canyonlands trip. People with medical conditions, including pregnancy, should have a physician’s approval before taking an adventure travel trip. Everyone is required to sign a standard Acknowledgement of Risk form before the trip, acknowledging awareness that there are inherent risks associated with the trip. However, due to the nature of the activities, a condition of your participation is that you will sign this form and return it to our office before the trip begins. Anyone who refuses to sign the form will not be allowed to participate, and consistent with OARS Canyonlands cancellation policy, there will be no refund of the trip fees at that time. O.A.R.S. Canyonlands, Inc. and cooperating agencies act only in the capacity of agent for the participants in all matters relating to transportation and/or all other related travel services, and assume no responsibility however caused for injury, loss or damage to person or property in connection with any service, including but not limited to that resulting directly or indirectly from acts of God, detention, annoyance, delays and expenses arising from quarantine, strikes, theft, pilferage, force majeure, failure of any means of conveyance to arrive or depart as scheduled, civil disturbances, government restrictions or regulations, and discrepancies or change in transit over which it has no control. Reasonable changes in itinerary may be made where deemed advisable for the comfort and well being of the participants, including cancellation due to water fluctuation, insufficient bookings (this trip requires a minimum of 4 guests), and other factors. There is risk in whitewater rafting, particularly during high-water conditions. Rafts, dories and kayaks do capsize. You could be swept overboard. Your guide will make every attempt to assist, but you must be strong and agile enough to “self-help” and “float-it-out” without further endangering yourself or others. We reserve the right not to accept passengers weighing more than 260 pounds or with a waist/chest size exceeding 56 inches. We may decide, at any time, to exclude any person or group for any reason we feel is related to the safety of our trips. We are experienced at accommodating people with various disabilities. Please give us an opportunity to make you feel welcome. We need to discuss any special requirements ahead of time. On advancement of deposit the depositor agrees to be bound by the above recited terms and conditions. Prices subject to change without notice.